The last time I posted I mentioned how I was unhappy and how I needed to find happiness. Well ladies and gents, I believe I'm beginning to find it. I've decided to switch my workout plan, my eating habits - actually most of my habits switching out for new and better ones, and the way I present myself. 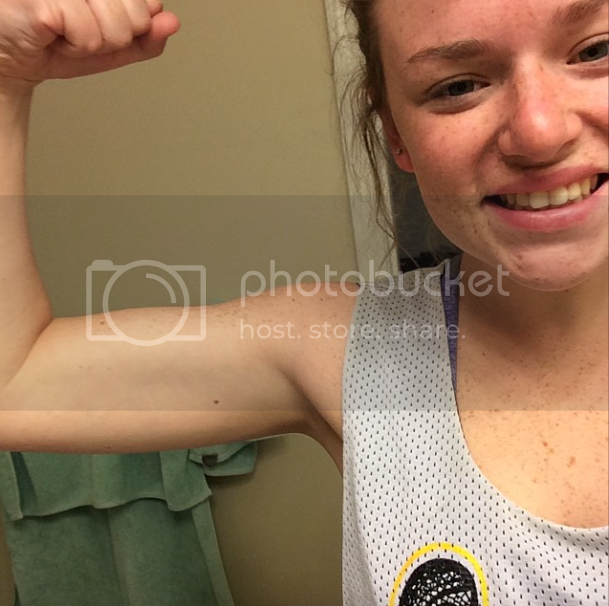 I mentioned in this post that I previously did MuffinTop-Less.com's Fit Body Guide and I loved every single workout and despite my slow progress on the outside I was much happier with myself overall. I took that knowledge into considering while choosing how to find my happiness and I went to BodyBuilding.com and I looked up plans that would work best for me. The James Grange Rewired 9-Week plan is what I finally decided on. I'm two days into the plan and I'm sore and I've already fallen back in love with the gym and lifting just like I did while doing MuffinTop-Less's plan. My boyfriend has also decided to take his health more seriously and get back into shape so now he is accompanying me to the gym. We don't work out together while we're there but the fact that I have someone asking me to go to the gym and reminding me that I have a workout to do is a great motivation. We usually warm up by playing basketball, usually playing a game to 21, but today we both attempted squash. The keyword there was attempted. I had a breakdown because the competitor in my couldn't figure out how to hit a ball with a racket but he calmed me down and taught me. After getting the hang out swinging we both sort of got the hang of it. We didn't play with any rules; we have a lot more progress to go before we're capable of doing that. My other goals are to kick some really bad habits. I have a temper. I have a tendency to be a bit of a hypocrite. I bully myself. I can be a bit of a witch with a 'b' to others. I don't dress myself happy. I've become a firm believer in "look as good as you feel, and if you don't feel well, look better". My goal is to update monthly on how I look, feel, treat others and how calm I tend to stay and to be honest about it all. I know I'm not perfect and I know I won't become perfect but that doesn't mean I can't try. Wish me luck. I'm going to need all that I can get. It's January 22, 2015. It's 22 days into 2015 and I'm already bored and unsatisfied with how my life is. I'm sure if it is because I'm unsure of what exactly my future holds at the moment, with my workout regime, my location, or my lack of excitement. I'm not in school this semester, Spring 2015. It's not completely my choice to not be attending again until the Summer 2015 semester but it is something that had to be done for many different reasons. Maybe that's what is making me feel unsatisfied. I love learning and right now I feel like I'm not learning a lot. I want to start and run something important. I want my life on this Earth to be important, but I'm not even sure how to get there. I started 2015 with the goal of finishing Kayla Itsines's Bikini Body Guide (the first 12 weeks). I've started the Kayla Itsines's BBG weeks 1-12 before but I've never completed it. I always get really bored. I don't know why either. 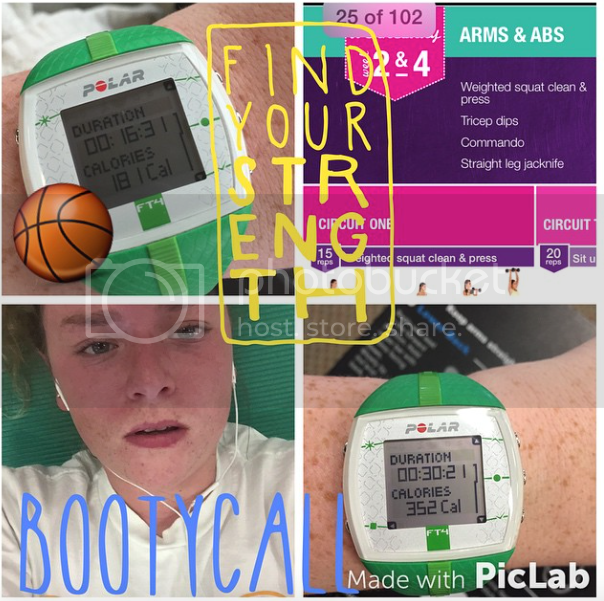 Kayla's BBG consists of 12 weeks with three resistance training workouts a week that consist of two circuits that last about 7 minutes each. The whole workout should only take about 28-30 minutes to complete. It's hard. It's extremely challenging and there are days where I just can not complete the Bikini Body Guide's workout for that day. I also don't feel satisfied with my workout after completing it. I know I worked hard. I can feel the sweat on my body and the soreness in my muscles, but I just don't feel happy about it. I feel much more like a loser than I believe someone who just finished an intense workout should feel. I also promised myself that during the first 6 weeks of the year I would participate in ToneItUp.com's Love Your Body 2015 series. This would be happening during the same time that Kayla Itsines's workout would be going on. I really love Karena and Katrina's workouts that are posted weekly on the Tone It Up website. The community that Karena and Katrina have created on their own website and through other social medias that include Instagram, Twitter and Youtube is an amazing community. Girls and women are coming together to encourage one another to complete their goals to love their bodies and to enjoy working out. They have competitions throughout the year that include both the Love Your Body series and the Bikini series. It's amazing. You can find most workouts on their websites or purchase the Tone It Up Nutrition plan and receive weekly member-only emails and a few DVDs to keep all the workouts together! It's an amazing website run by two amazing and motivating women. Between the two mentioned workout series I enjoy ToneItUp.com's much more than Kayla Itsines. There is nothing wrong with Kayla's BBG except for the fact that it doesn't excite me. I get very bored with it very quickly. I look back to early 2014 when I was on a steady workout routine and was actually getting in shape and stop self-hating I wasn't doing either of these workouts. I was following MuffinTop-Less.com's Fit Body Guide and I loved it. I LOVED actually lifting heavy weights and not those small 3 or 5 pounds dumbbells and body-weight exercises (even those workouts can actually make you really really sore if you do them correctly and enough). Maybe I need to stop following what everyone else on social media and my life is doing to get in shape and just do what works for me. I need to travel. I feel trapped and alone here. I have my family here though. Why am I trapped? My boyfriend and his family are here. Still trapped. I feel like I'm stuck in a room and no one visits. Is this normal? I need to figure this out. This is my future. This is my happiness. Here I am, starting off another year in my life trying to make myself the best possible version while all still trying to find who I am and who I am supposed to be in this world. I'm 21 years old and I've felt lost in my own life since I was 19. I don't actually have any idea what I want to do with my life. I see all these people around me graduating college, getting married, working some of the coolest jobs and I'm a server at a restaurant in my hometown, I'm so far behind in school that I actually think I'm never going to graduate, and I live at my parents house. I can't help but compare my life to those who have been mentioned. I understand that I shouldn't compare my life to anyone's and I shouldn't be ashamed of myself, but you all must understand. I live at home to save money and to partially figure out who I want to be. I've been home for almost 4 months and all I have done is transferred colleges - again. I still work my serving job and I have no others lined up nor do I have an internship coming up this summer. My closest friends are either graduating and moving away, graduating and working at cool jobs thatbtheybare proud of, or some are heading off on their own journey to find themselves with a higher chance of succeeding than I do. Now it may seem that I've just continued to bash myself this entire post but I hope you know that I've realized that and hats why this blog (and my YouTube here) even exists. I want to begin my life already but I want to live by the phrase "chase your passions not your pensions" so that's exactly what I'm going to do for now. Hopefully I will realize what I want in life soon, and I will return to my independent self who didn't mind being alone instead of the girl who is constantly sad, terrified of being alone and has become so dependent on another human being that she can't leave them for more than a week without thinking they don't/shouldn't want her. I hope you all join me over these next 9 ish years to watch me grow and share with the world that it's okay to not follow the path that society has made us believe is the only one.